Early Monday morning, I met my friend, Ernie Sears, at Prince William Forest National Park. 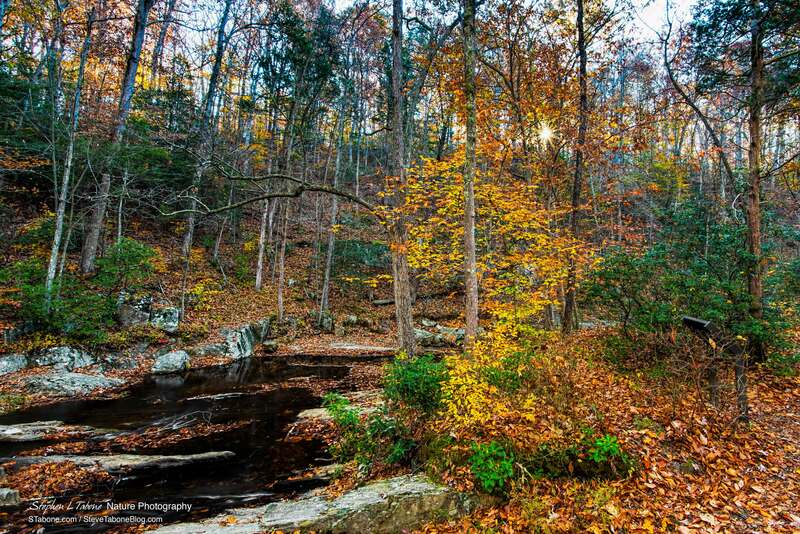 Prince William Forest encompasses over 19,000 acres and has over 37 miles of hiking trails. 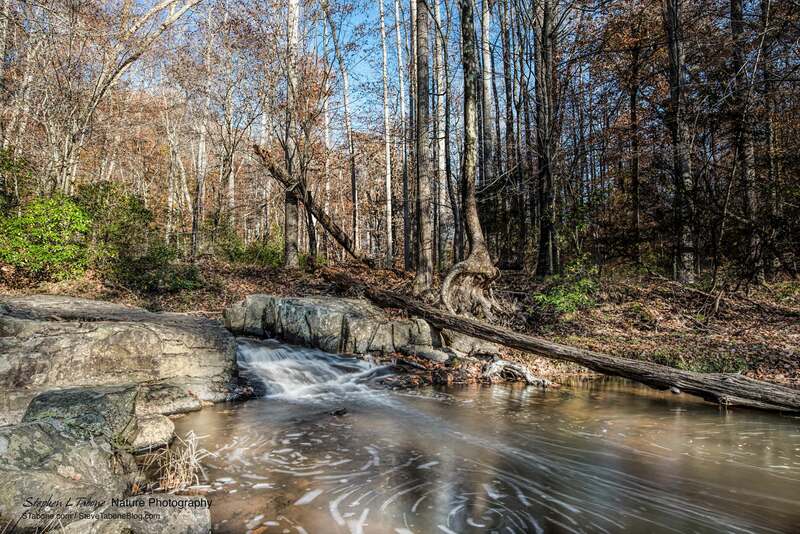 The northern Virginia park provides a quiet and peaceful respite from the surrounding suburban masses and the very close and always busy Interstate 95. When deep in the forest, it is easy to forget the nearby traffic and crowded areas and imagine what native Americans and the early settlers experienced. 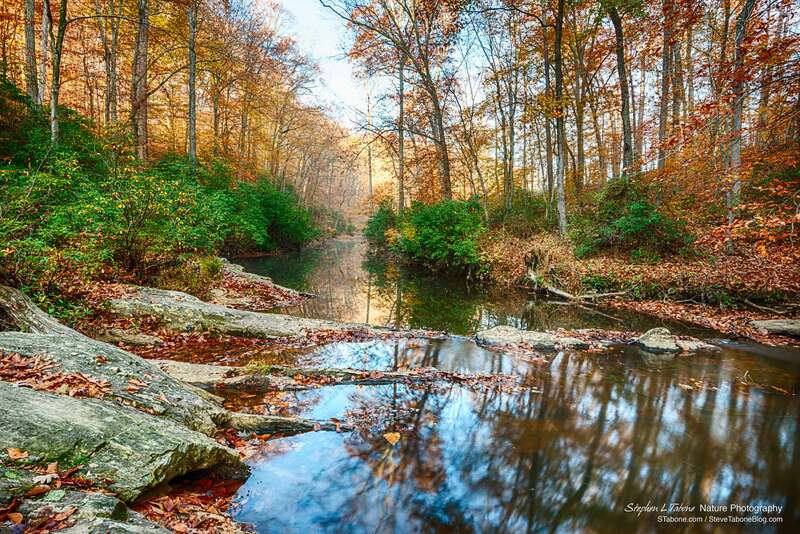 We hiked over five miles looking for places to capture what remained of the autumn colors and found a couple of locations along Quantico Creek that provided picturesque views. When we first arrived at the creek, there was a light fog that could be seen up the creek from where we stood (above image). We were there about an hour, during which time the sun rose over a ridge and the fog cleared (below image). As you can see from the above and below images, most of the leaves had fallen. However, there were still enough leaves left in the trees for us to enjoy and capture the autumn colors. 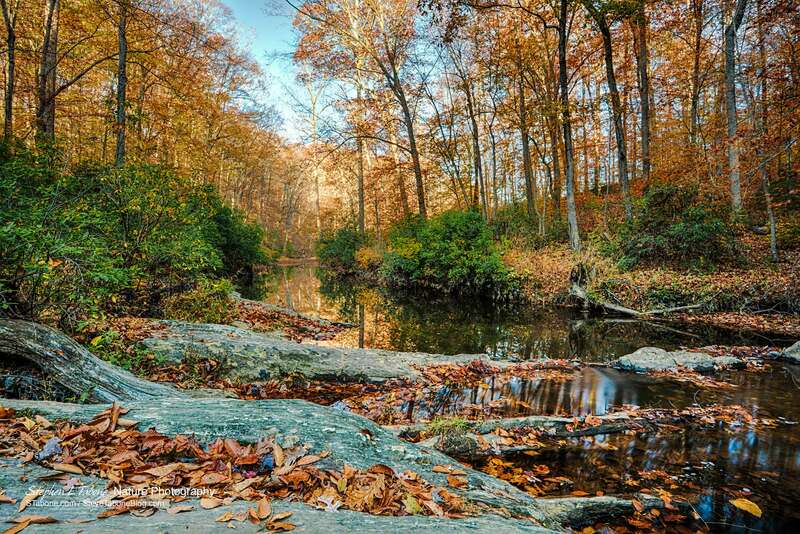 The fallen leaves also provided color on the creek’s banks. About a mile from the above location, we found a small waterfall. The amount of water in the creek and its flow were minimized by the recent lack of any substantial rain. Nevertheless, I made the best of the “trickle” by using a slow shutter speed to soften the water and to capture the swirl, as seen in the foreground of the below image. The above photo is a composite of two images. One image was shot at a very slow shutter speed to soften the water and to capture the swirl in the foreground, and the second image was shot at a much higher shutter speed to properly expose the background and surrounding rocks. The two images were blended together in Photoshop. The images in this article were taken with either a Nikon D800 or D810 and either a 24-70mm or 16-35mm lens. 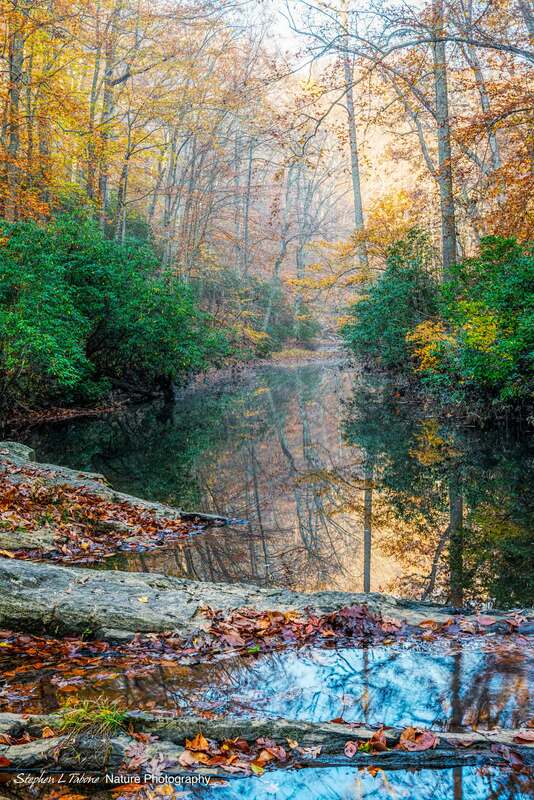 This entry was posted in Autumn Photography, National and State Parks, Nature and tagged Fall Colors, Prince William Forest, Prince William Forest National Park. Bookmark the permalink. Your outstanding photography skills really show in these images! As you wrote, we didn’t have the best of conditions in that we had missed the peak of color and high winds the previous couple of days stripped the trees of many of the leaves. But your images show that with the right skills, lemons can make some pretty tasty lemonade. Beautiful images and love what you did in Photoshop! I have been reading your blog since we met at Butterfly World in South Florida last January. I look forward to viewing your lovely images in each new post. Regarding the photos in this post, do you know the ID of the green shrubs along the shoreline in your images? The fact that they are still deep green this late in the season when the other foliage has its fall colors makes me think that they are non-natives. Exotic honeysuckles perhaps??? Gary, sorry, but I do not know what those green plants are, but would have guessed wild rhododendrons. Steve, these are stunning! I am awed.